The initial physical therapist provided his unapologetic interpretation of my situation and physical condition, as I lay gasping in pain on the patient table. His outlook was poor and his news was less than unpopular; he was absolutely positive my current condition may never improve. I was angry and teary-eyed as I ran out of the physical therapy room. This information somewhat coincided with my musculoskeletal doctor, who had attempted several interventions only to make the situation worse, rather than finding a way to improve it. After several failed attempts to help me, the doctors convinced me to give in to the idea that this may be it for me, and they asked me to consider taking a break so as to make things easier on my body. After all, my military accident had even caused a neurological disconnect, that was most likely irreversible. This advice included giving up most things that I love, but I was not quite ready. So I convinced them to get a second opinion from a different physical therapist, they then also enrolled me in the pain clinic and set me up with a mental healthcare provider. I was in less pain by following their advice….but my muscles had atrophied, my spirit was low and my heart hurt. I wanted my life back and who were they to tell me I could not have it? It scared me at the time, but in so many ways the near death experience brought me to life, and I felt like I was wasting my second chance, by giving in and doing nothing. At some point, I had enough of doctor’s professional opinions and I felt was time to take my health into my own hands, so to speak. I began a journey, a search for different answers to my questions. Different solutions for my body, mind, and heart. This took me into the realm of more holistic care such as acupuncture, massage therapy, dry needling, meditation and herbal supplements. Lots of research went into it since regular medical treatment was not working out as I had hoped. It also has me taking a different look into how I work/use my body, and how I fuel it via my diet. Some things have worked, some things have not. It has been a journey of trial and error, but one that has led me down a path of discovery, possibility, hope and yes, even intrigue. I have gotten in touch with my body and mind; more than I knew was even possible. I often tread a fine line…and I do mean very fine line…between pushing my body just enough and pushing it too much. It is a dance of sorts, and in some ways, I hope the journey never ends. Pain…it is still there, almost daily. I am on a medication which thankfully helps to reduce it, but so far there is no miracle cure, and honestly I am not holding my breath for one. Pain…is a teacher, an acquaintance, a measuring tool and an invaluable warning to what is happening for my body. I have sat with it, endured it and listened to the story it tells me. I refuse to give it complete control over my life, however, as this is not a place I am willing to allow it to reside. Mind over mountain. I mean this figuratively and literally. It is impossible to know what you are capable of unless you have tested what you assume, is your limits. Your mind is the most powerful tool you have at your disposal and your body is its vessel. They are equally valuable and inseparable from one another, taking care of both is vital. At times, I find I must ask my mind to do what my body believes it cannot and vice versa. Trauma has a funny way of expressing itself in the body and I do not mean funny as in haha. The way it is expressed in your mind and the way it is expressed in your body can be very different. Sometimes my body says “it cannot” and my mind whispers…”just try.” Sometimes my mind says “I do not know if this is a good idea”…and my body says “Actually, I think I have got this.” The trouble is in knowing which to listen to, when and how often. Recently, I hiked a 14ner. Yes, that is me in the picture above, just 5 years after my near death experience! The first time I made the hike, I did not summit. I listened to my body and while my heart wanted to keep going, aka not give up, my body said it was not time. The second time I hiked it, I did summit! 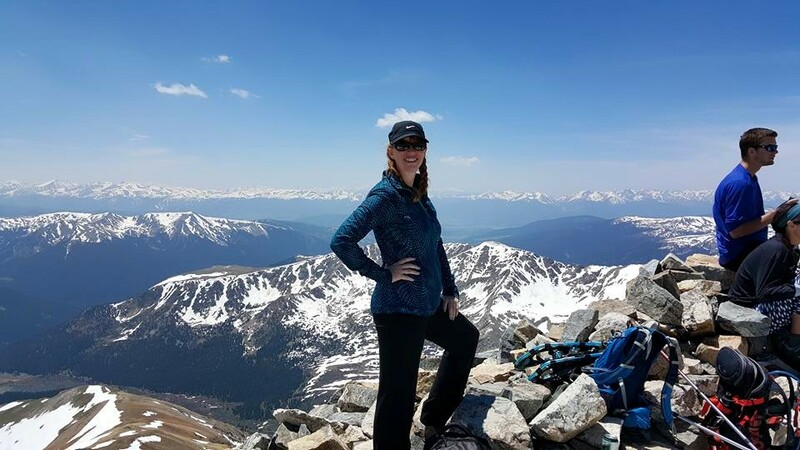 There were several times my body wanted to quit, but my mind kept saying…”just a few more steps”….”just one more step”…”you got this.” Both hikes challenged me differently, both physically and emotionally. To describe it would indeed cause this post to be way too long. You see, it takes me almost a full week to recover from this type of hiking. It does cause me pain and even worsens it for a short period of time. Yet, to me, it is worth it. It helps me stay focused on my goals. The mountains and the outdoors bring me peace, and the journey always teaches me something about myself, I did not know before. As I work to get stronger, I fully believe my hiking expeditions will get easier and my recovery time shorter. I still have a long ways to go, on so many different levels, but I am in it to win it. If I could offer anything to anyone suffering from a chronic condition it would be this…. Never give up hope. Never give up on yourself. Get in touch with your body (in a non-sexual way), so that you know it intimately. Its quirks, what makes it tick, what makes things better for you and what makes things worse. Journal, if necessary. Know that everybody is different and what might work for others may or may not work for you. You may find answers to your questions in places you would not have considered looking before, so keep your options open. Do your research and be your own advocate. You are your best advocate! If you think your doctor is heading down the wrong path, do not be afraid to speak up. They are there to help you, but they are not perfect and they only know what you tell them. Be as fearless as you can be! Recognize it is a process and a journey, be gentle with yourself along the way. Every day is different, some are harder than others. Most days I am able to maintain a positive “go get it” attitude. On the tougher days, I remember to be grateful for the good ones; I remind myself of all of the progress I have already made. I remember to be compassionate towards myself, as often as possible. I do occasionally allow myself to briefly wallow in a bit of self-pity…because you know what, it is tough dangit! However, I keep those times short, pick myself up and keep moving forward. Life is worth living…get after it! This is my motto. This entry was posted in Thoughts and tagged chronic pain, hiking, holistic treatments, massage therapy, medicine, physical therapist, physical therapy, supplements. Bookmark the permalink.